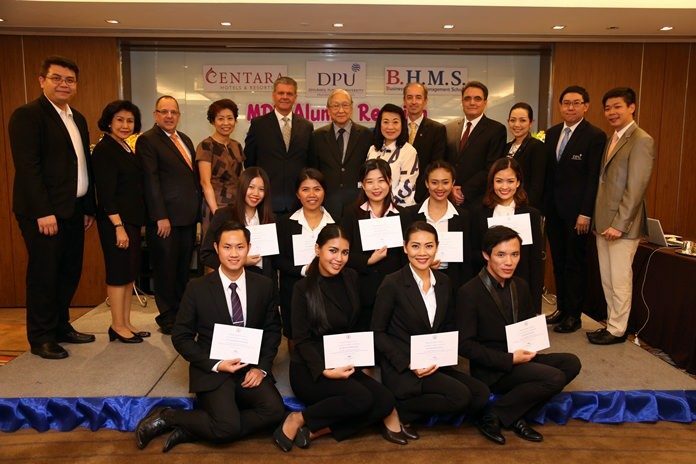 Chris Bailey (standing, 5th left), chief operating officer of Centara Hotels and Resorts, along with Prof. Dr. Boonserm Weesakul (standing, 6th left), president emeritus of Dhurakit Pundit University, recently hosted a congratulations party and presented certificates to employees who will be attending an apprenticeship at the Business & Hotel Management School (BHMS) in Switzerland. The hospitality training program was created with cooperation from Centara Hotels and Resorts, Dhurakit Pundit University and Business & Hotel Management School in Switzerland. The event was held at Ladprao Suite, Centara Grand at Central Plaza Ladprao Bangkok.